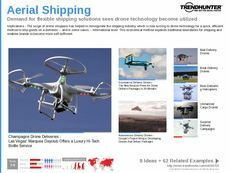 Find Better Ideas, Faster ® with a custom drone tech trend report, our PRO Dashboard and 80+ categories of premium trend reports. 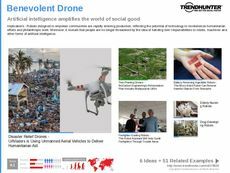 The Drone Tech Trend Report uncovers the many uses and functions of flying drones in the realms of entertainment, advertising, photography and even social good. 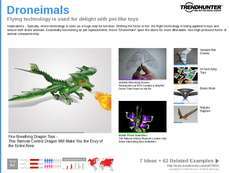 First, we look at remote controlled drones that are toys for both children and adults. Then we examine flying cameras that use drones to take aerial videos and photography. 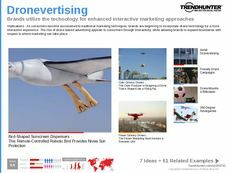 Drones are also used to create interactive innovative marketing campaigns as well as deliver products to consumers in a novel way. 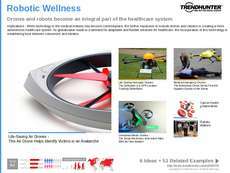 Finally, drone technology is now being utilized to plant trees, provide disaster relief and guide firefighters. This is a great report for technology and drone developers as well as professionals looking to collaborate and use this technology in the realms of photography and entertainment. Brand professionals and marketers wanting to reinvigorate their products or services can use drones to deliver products in a novel and specialty campaign. The Drone Technology Trend Report illuminates the many areas that drones have uses in that allow them to do tasks humans can't complete, or at least more efficiently.